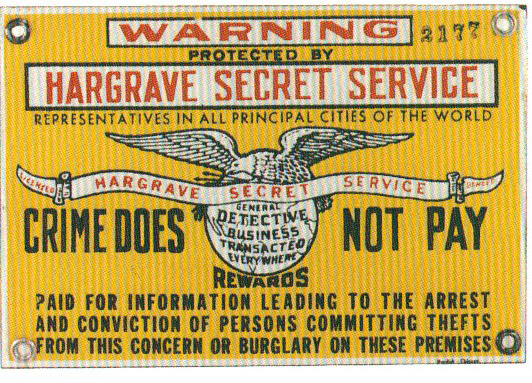 This is a rectangular Hargrave Secret Service porcelain sign. This particular Hargrave Secret Service sign is yellow with red and black text. It reads, “Warning, Protected by Hargrave Secret Service, Representatives In All Principal Cities of the World, Crime Does Not Pay, Rewards Paid For Information Leading To The Arrest and Conviction Of Persons Committing Thefts From This Concern or Burglary On These Premises” and features an eagle perched on a globe in the center.